Amritsar lives in many centuries at once. This holiest city of the Sikhs is home to their most revered shrine, the mystical and awe-inspiring Golden Temple, where nihangs  members of an armed Sikh order  live on in traditions dating back centuries, sporting distinctive electric-blue tunics and a panoply of weapons, even speaking a unique martial dialect of the Punjabi language. Other parts of this prosperous merchant city wear Levis, hang out at cafés, follow the latest diet fad or carry the latest iPod. 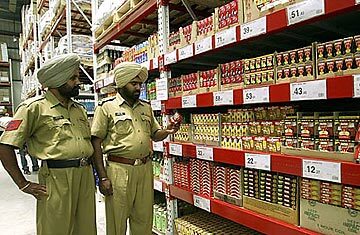 And since May this year, Amritsar has also been home to India's first Walmart. Located on the Grand Trunk Road, the subcontinent's lifeline dating back to the 16th century, the store is a good half-hour's drive out of the city but has been attracting a steady, if small, stream of customers and wide-eyed spectators since its launch on May 30. At 50,000 sq. ft. (about 4,600 sq m), it is almost tiny by U.S. standards, and there are fewer than 50 vehicles in the parking lot outside  mostly passenger cars, with a handful of small commercial vehicles, SUVs and some motorbikes. A blue-turbaned, elderly Sikh with a flowing white beard kick-starts his scooter while balancing a small knapsack of shopping on the seat behind him. It is a very different Walmart; in fact, it's not a Walmart at all. It is called Best Price Modern Wholesale, in collaboration with Walmart's Indian partner Bharti Enterprises, in order to get around the country's rigid foreign-investment restrictions. Members of the store have to be in business in order to do transactions in wholesale, but their families get cards that allow them to buy at retail prices. All sales are in cash. One advantage of being in Amritsar is that almost everyone in the business-oriented town is a merchant. Furthermore, the cash-and-carry format allows Bharti and Walmart to co-opt a part of the competition  the mom-and-pop, or kiryana, stores  by turning them into customers. In fact, there's a section within the Best Price store called a "model store," where kiryana shop owners are taught how to arrange goods in their store and optimize inventories to maximize profits. One of the regulars at Best Price is Rohit Kalia, 29, a restaurateur, who is filling an already overflowing trolley with a 5-kg pack of paneer  the Indian vegetarian's favorite cottage cheese  and 12 tins of baby corn. Kalia says he visits every second day for supplies since he gets many things cheaper here. "This store has certainly expanded my range of choice," he says. "But it's just one more store where I buy supplies from. I still get better prices and more convenience shopping at my usual suppliers." He is cut short by a commotion  the appearance of a forklift has created a stir. Children are gazing, enchanted, while adults look on with barely concealed curiosity. The store staff quickly rush in to cordon off the aisles that are being restocked, and gradually it's back to business as usual. It may take a while, however, to persuade the locals to change their shopping habits. "I'll come here only once in a while," says Dalvinderjit Kaur, a housewife, whose son is filling out a form to get membership at Best Price. "I have shopped at the same kiryana shop for 18 years." There are many reasons customers like Kaur prefer their kiryana shops: they deliver for free, even for small orders; they allow regular customers credit; and they are close by and personal. "He knows us so well," she says. "When my daughter went to America to study, he called to ask, 'Madam, is your daughter not home? You haven't been ordering cheese singles!' If I run out of shampoo or detergent, I can just phone him, and he'll send a boy with the stuff, free of charge." Best Price has tried to match this, but customers have to pay for home delivery. It has also linked up with Kotak Mahindra Bank to offer "business cards" with which customers can shop on credit for 14 days. Kalia, the restaurateur, laughs at this: "In a country where half the economy is a black economy, how do they expect a shopkeeper to give checks and put all transactions on record?" See pictures of retailers that have gone out of business.